Hey, guys! I have been meaning to post this for quite some time now. 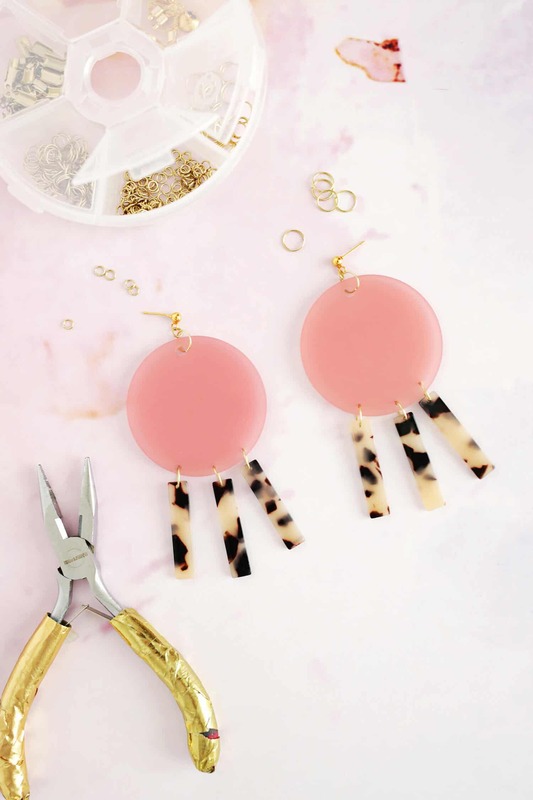 Over the last few years, jewelry trends have gravitated toward bigger, chunkier, and sometimes homemade looking jewelry. I LOVE this trend! Emma and I call these necklaces “Art Teacher Necklaces” because they remind us of our mother, who was an art teacher when we were growing up! And in fact, art teacher style is one of my inspirations! I love the messy bun, pair of overalls, chunky jewelry, and some accidental paint on my hands look. To me, it’s the most comfortable and natural style in all the world. So today I’ll show you how I’ve been making these fun little necklaces. I’ve also bought plenty from awesome Etsy shops, my friends, and stores like Anthropologie. You can’t have too many. They’re a worthy collection. I have bought my beads all over. Some are from craft stores. I like to buy plain wood beads as well as beads that are already colored. I also found some cute geometric shape beads from Wish Supplies on Etsy. If you want to get super specific with your colors, you’ll want to purchase acrylic paint (or craft paint) to re-color your beads. After that, use a Sharpie to add fun patterns quickly and easily! Step 2: String ’em up! Make sure your leather cord is long enough that you can just barely slip the necklace over your head. Simply knot the ends of the cord to secure the necklace permanently. 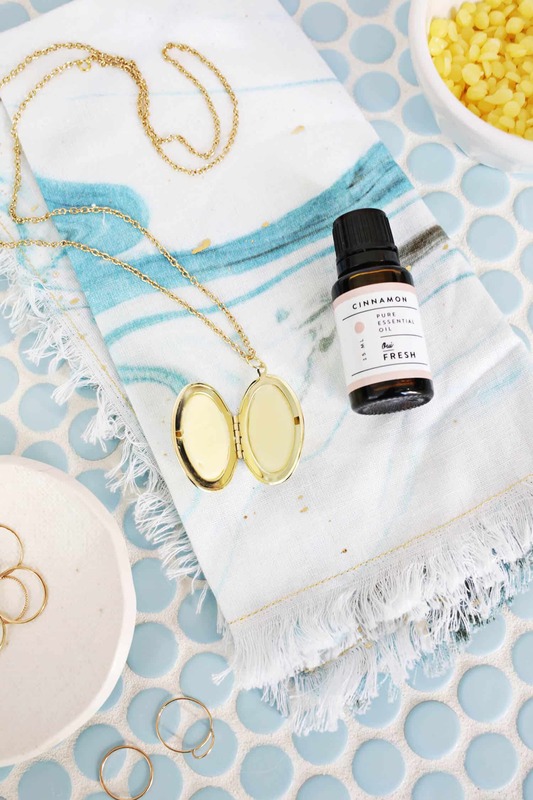 It could not be more simple and the necklaces are super cute and wearable. I made one for all the girls in my office! Credits// Author and Photography: Elsie Larson. Photos edited with A Beautiful Mess Actions. CUTE! Question: Where is the signage board from? I love it. Such a cute, simple project! I love when you ladies post this kind of thing. I’m also excited to see what the ABM community creates from this inspiration! This could not be any easier and cuter. Holy moly, doing this. Happy Birthday Emma! Can’t wait to make myself one of these!! So simple and so cute! I love the uses you ladies find for sharpies too. The simple sharpie pattern designs totally add to the overall look. Love it! That should indeed be the official name of these necklaces, great imagery. And beautiful whimsical necklaces – I love the personalized touches to the beads. Haha, ‘art teacher necklace’ is such a great name! I always seem to gravitate towards chunkier jewellery, and this design looks perfect for me! I absolutely love the turquoise bead with the drawn crosses! Very chic! I’m an art teacher who has come to the very practical realization that, with my hanging microphone (a luxury that saves my voice during long days of demonstrations and classroom management) and my ID badge lanyard, I just don’t have any more room on my chest for cool necklaces at work. And bracelets and rings get junky with clay, paint, etc., so fun earrings and the occasional well-arranged scarf (lanyard peeking from below, microphone balanced on top) are the only accessories that I go to anymore. These are nice however, and remind me of some of my favorite necklaces my mom had when I was growing up! Simple project for my grand-kids…thanks for sharing! These are so artsy! I didn’t know your mom was an art teacher – we can definitely see where you get your artistic influence from! They’re so cute and good for gift’s x.
thats looking adorable. thanks for sharing. Wow! These beads are incredible! I love the necklaces, so cute! I have plenty of this type of necklaces I adore it!! I’d like to see your collection !!!! Yesss, I love this DIY! Really love the look of the chunky, mismatched beads. Happy birthday Emma! I know you didn’t explicitly say it but great idea using pipe cleaners to help hold the beads. I have a bunch of plain wooden beads I have been wanting to paint but haven’t been able to find a good way to hold them or let them dry. I have A LOT of pipe cleaners or Chenille Sticks. Thanks! Adorable, I need to make this with my niece. Cute! As an English teacher I would love these necklaces as well! I love these necklaces. I would really love to see more jewelry DIYs on here. Absolutely love this necklace…definitely making this soon!! can you tell me where to get it? Happy Birthday Emma. these Necklaces are so cute. 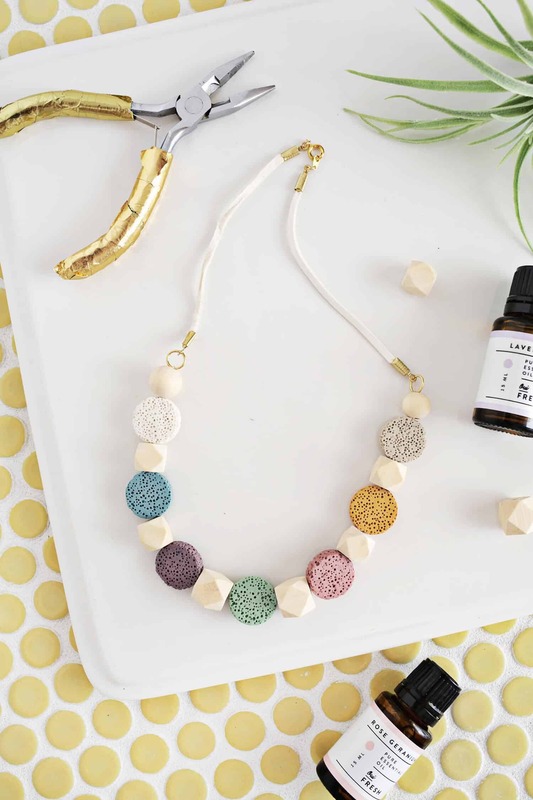 Love the beads…I like to make necklaces similar to this with ceramic beads mixed with found beads! Thanks for sharing! What a nice idea to add details with a sharpie! Love to try that some time!